What are the ligaments of the ankle? The ankle is a hinge joint between the leg and the foot, and allows up and down movement. The bones of the leg (tibia and fibula) form a slot, and the talus bone of the foot fits between them. The talus is held to the tibia and fibula by strong bands of tissue called ligaments. Each ligament is made of many strands or fibres of a material called collagen, which is extremely strong. The ligament on the inside of the ankle (the deltoid ligament) has two layers; the deepest one is most important. This ligament is mainly torn in association with severe fractures of the ankle bones. Sporting injuries of this ligament are rare. The ligament on the outside of the ankle (lateral ligament) is made up of three separate bands: one at the front (anterior talo-fibular ligament), one in the middle (calcaneo-fibular ligament) and one at the back (posterior talo-fibular ligament). The front and middle bands are the ligaments injured in a sprain. The tibia and fibula form a joint between themselves just above the ankle. 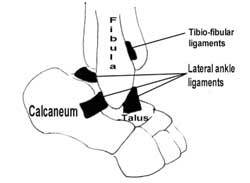 This also has strong ligaments, one at the front and one at the back (tibio-fibular ligaments). The ligament at the front is involved in 10-20% of ankle sprains; this injury is important, as it takes a long time to heal, although it usually heals without the need for surgical treatment. How do the ligaments get injured? Most ankle ligament injuries are caused when the foot twists inwards. All of the body’s weight is then placed on the lateral ankle ligaments. The anterior and middle fibres of the ankle stretch or tear in a sprain or strain of the ankle. Occasionally small pieces of bone may be torn off with the ligaments. In a few cases, a twisting force on the ankle may cause other damage. The bones around the ankle may be broken, a piece of the cartilage lining the ankle may be chipped off, ligaments connecting other bones in the foot may be sprained or torn, or the tendons around the ankle may be damaged. Most simple sprains get better without any special treatment. However, if you have a severe injury or the initial injury does not recover normally, it is usually best to see a physiotherapist. The hospital emergency department or orthopaedic department, your own GP or your sports club can arrange this. Physiotherapists also advertise in Yellow Pages. WILL I KEEP HAVING TROUBLE WITH MY ANKLE? – leading to ankle pain and swelling. HOW WOULD ANKLE INSTABILITY BE DIAGNOSED? Your doctor or physiotherapist will examine you and look for any sign that you have some other problem around your ankle, such as damage to the joint surface. They will stretch your ankle to see if the ligaments are abnormally weak. An X-ray will usually be taken to see if there is any damage to the bones of your ankle. Ligaments do not show on X-rays. Ligament damage can be shown by taking X-rays with your ankle stretched in various directions (“stress views”) or with a magnetic (MRI) scan. WHAT CAN BE DONE ABOUT ANKLE INSTABILITY? • Strengthening the muscles around the outside of the ankle. • If your ankle or Achilles tendon are stiff, you will also be shown exercises to stretch these. • If your foot shape makes you prone to extra stress on the ankle ligaments, a moulded insole may be advised for your shoe to reduce these stresses. • Trial of a brace, or strapping for activity or sport. Most people will find their ankle much more stable and comfortable after physiotherapy. However, in some people problems continue. At this point the opinion of an orthopaedic foot and ankle surgeon may be helpful, and your general practitioner may refer you for further treatment. The surgeon may also suggest an exploratory operation on your ankle (arthroscopy) to check on the state of the joint. If these tests suggest weakness of the ankle ligaments, an operation may be advised. Will I need an operation? Most people with ankle instability will not need an operation. Even if your ankle still feels unstable after physiotherapy, you could try a brace rather than having an operation to tighten up or replace the ligaments. However, if no other treatment makes your ankle comfortable and tests show that the ligaments are weak, an operation may help. • The damaged ligaments are tightened up and reattached to the bone. • One of the nearby tendons is used to replace the damaged ligaments. • In 5 to 10% of people the surgery does not work, and the ankle remains unstable. I sprained my ankle three months ago but it's still painful and swollen. Why? You can’t absolutely prevent another injury, but there are things you can do to reduce the risk. Obviously, take care when walking to avoid catching your foot on uneven bits of pavement (especially when you are in a hurry or have had a few drinks). High-heeled shoes put extra stress on your ankle and should be avoided. If your ankle or Achilles tendon is stiff this puts extra stress on your ankle ligaments when you walk or run, and exercises would probably improve this. If you play sport, you should take extra care to warm up and down properly, with plenty of stretches to your ankle and Achilles tendon. Strapping your ankle or wearing a sports ankle support (which can be bought at most sports shops) may reduce the risk of another injury.